your diet is dehydration. Simply put, if your body doesn’t have enough water available for its needs – digestion, breathing, blood circulation and other activities – it begins to draw on the water in its own tissues to fuel it. As it pulls on those supplies of water, the functioning of your body begins to be affected. The eventual result of dehydration, if left untreated, is death. That’s a pretty scary and dramatic outcome, and here in the United States we seldom see death by dehydration except in extreme cases. treatment. It’s particularly dangerous for the elderly, who are often chronically in a state of mild dehydration, and young children and infants who can rapidly become seriously dehydrated during an illness. save your child’s life. Because children are so small, it takes far less fluid loss for a child’s body to become seriously dehydrated. If your child – or elderly relative – has diarrhea or is vomiting, keep an eye out for any symptom of dehydration and contact a doctor immediately if you see them. Dehydration can be a serious, medical emergency situation. Many medical experts contend, however, that as much as 75% of the American adult population suffers from chronic, low-level dehydration because we do not drink enough water on a regular basis. Are you one of them? Knowing the symptoms of dehydration can help you figure out if you should be drinking more water – and get rid of headaches, chronic pain, constipation and a multitude of other health conditions that can be relieved with adequate levels of water in your body. Low-level chronic dehydration can increase an athlete’s chance of heat injury, heat exhaustion, and heat stroke. Additionally muscle cramps, fatigue, and headaches can also be attributed to mild dehydration. 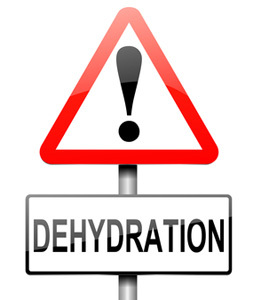 The earliest symptoms of dehydration are often overlooked or misinterpreted as something else – often hunger, according to some medical experts. Those who suffer from chronic, low-level dehydration, in fact, may be so accustomed to their general feeling of malaise that they don’t recognize a problem at all. If you have frequent headaches, chronic fatigue, chronic unexplained muscle and joint pain or difficulty focusing or concentrating on your work, the solution may be as easy as making a concentrated effort to increase your water intake.